....what you can straight up cancel. Our days have been full. Summer ended. Caroline was born. Stephen started 1st grade and all that that entails...homework! And in the middle of it all, George, in a fit of rebellion, dropped his dependable, lengthy afternoon nap. He's back to it, but he gave me a good scare. We are doing well. Caroline is a good baby (so far). Slowly, we are finding our new normal. 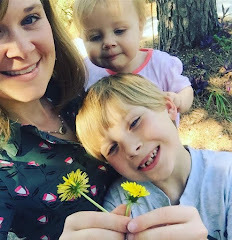 Here are four things that have helped me cope/adjust to this new and wonderful chapter of life with 4 kids. Somewhere I read the advice to go buy a new pair of jeans for yourself a few weeks after you have a baby. A pair that fit and work for right now. No one really wants to shop when they are freshly postpartum, but getting at least one pair of pants that work is a major morale booster. Lastly, here's my school girl. First day of K4! good tip about the jeans! So glad to hear you are finding your way and glad George got his nap back - yikes.